I am working on the Bass of Inverurie reconstruction project more or less full time now. 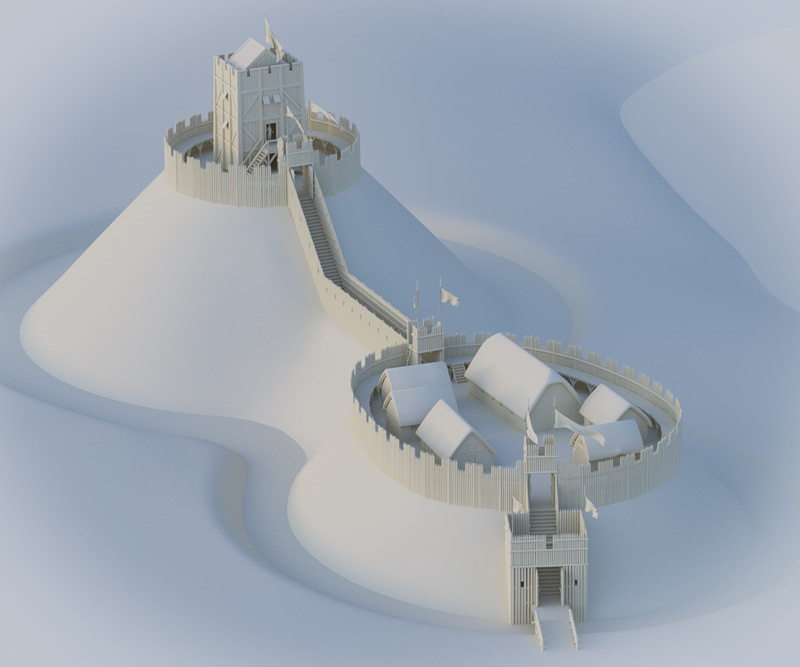 For the last few months, in between other jobs, I've been concentrating on the work of gathering information, making sketch drawings and trial 3D models of the castle. I've been busy reading quite a lot of material too - books, documents and archaeology surveys. A few weeks ago, I presented some of my first drafts to Aberdeenshire Council Archaeology Services who are very supportive of this project. 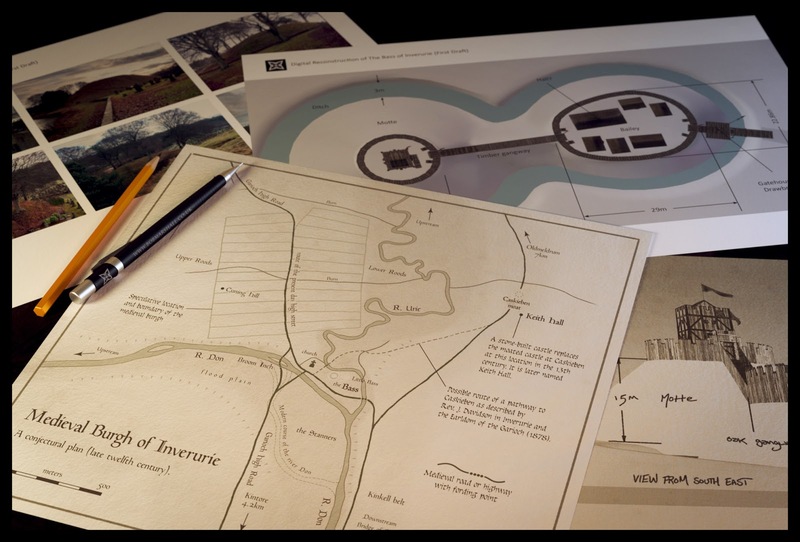 Hopefully when this project is finished, my reconstructions will have a home on some new on-site interpretation panels as well as educational material. I have now briefly turned my attention to the wider landscape and so I am busy creating some maps which pull together what little archaeological survey and documentary evidence there is. The maps are helping me to establish how the castle looked in situ with both the landscape and with the late twelfth or early thirteenth-century burgh. My research so far has revealed some interesting arguments about the location of the medieval burgh despite a lack of archaeological evidence for it! I am currently going with the more plausible of the arguments - that the burgh developed on the higher ground closer to where Inverurie's present high street is and out of reach of floods which, as we know very well, this area is vulnerable to. The Garioch Earls who built the Bass had a connection with a nearby moated castle known as Caskieben. The Bass of Inverurie’s constables were likely to be from the Leslie dynasty at Caskieben. This timber-palisaded castle was replaced in the thirteenth century by a stone-built castle later called Keith Hall when it passed to the powerful Keith family in 1662. I am spending some time in the library this week reading up a few documents which I am hoping will tell me a little more. Once I feel I have gathered enough information, I will progress with more high-detail 3D modelling. I am hoping to produce a series of static illustrations and if there is time and the resources to do so, perhaps an animated visualisation. 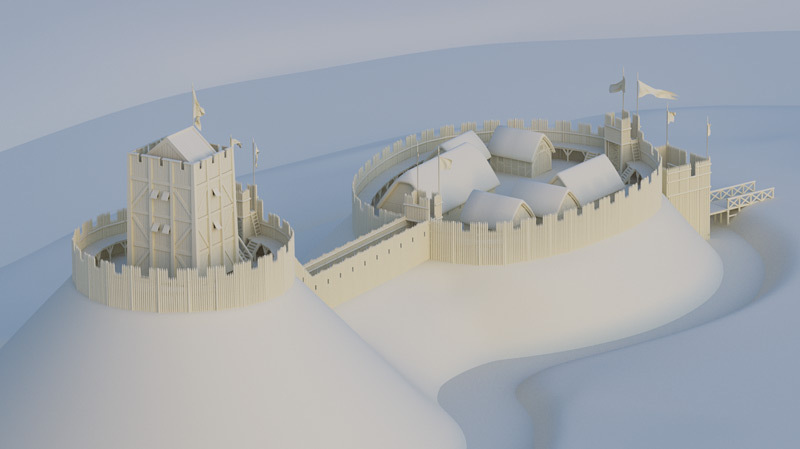 Above: some early stage models of the castle which I am using to test out various ideas factoring in the dimensions of the site and the surrounding landscape. Some of the elements pictured are likely to change as this project progresses. These are looking great already.